Over the summer we put on a large multi-player game, bigger than what can usually be accommodated in an afternoon of play. Gaming over two days at a rented hall, we still only partially completed Mark Davies' Battlefront WWII scenario, The Pompadour's Revenge. More frustratingly, it didn't conclude decisively (in fact, just as things were getting interesting) and ever since then I and the other principal, Phong Nguyen-Ho, have been itching to give it another crack, picking up where we left off. We will be doing just that this weekend. But as it is now pretty obvious on which part of the terrain the battle will be fought I have been able to recreate a smaller 6.5' X 5' playing area in my studio. 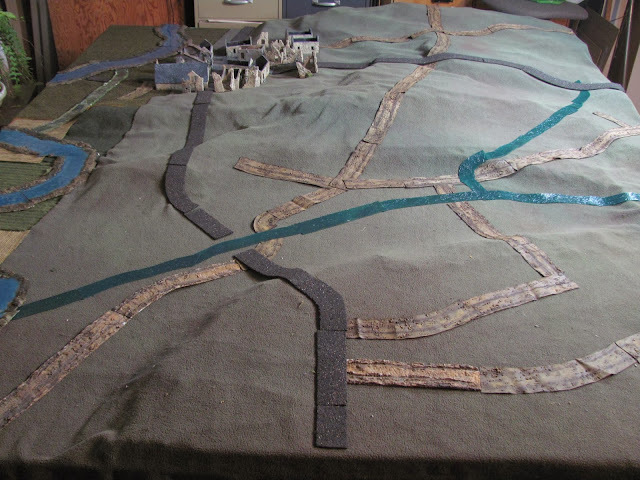 Better, having all week to create this undulating and densely terrained board, I've been able to more closely match Mark's original map, largely due to a new grid technique that I'm employing. 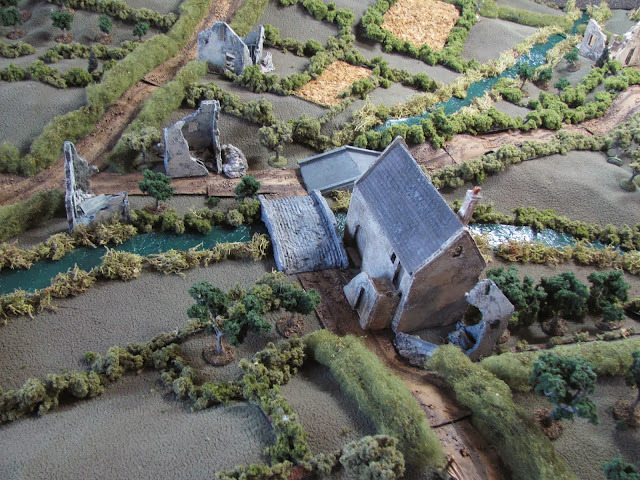 Not being a fan of permanent terrain, or to be more precise, finding that it doesn't work well for me mostly because it is pretty inflexible as far as storage goes and I'm interested in recreating historic battlefields, this entire board is modular. It took quite a while to set up but I find that is part of the pleasure of gaming. So I have decided to document it, just in case others are interested in at least one way of recreating an historical battlefield from a map. Here is the section of the map I reproduced from the game. I've flipped it as this is the orientation I used to set up and photograph the table. I have strengthened the grid and terrain lines in Photoshop so they are easily recognizable. 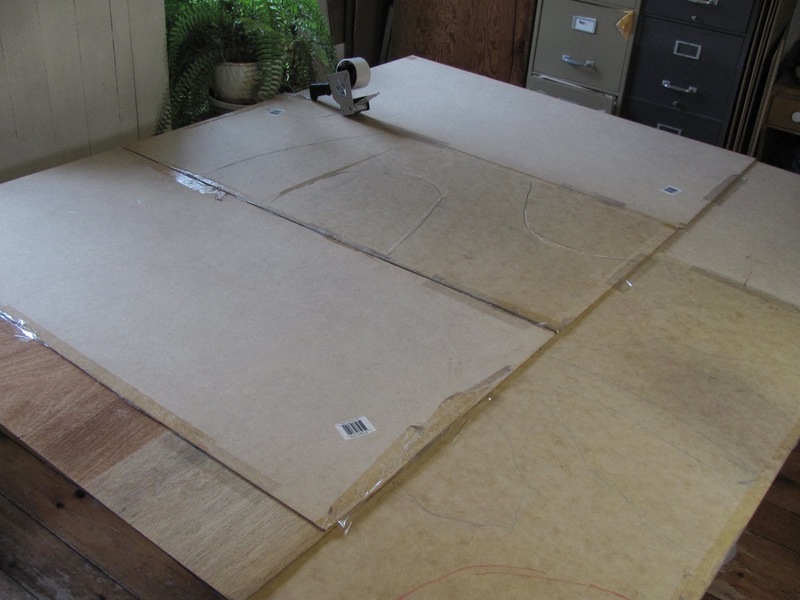 I start by building my table top with a series of 2'X4' pieces of masonite. I have about a dozen of these on hand. The boards are supported by two tables. I use a bit of packing tape to keep them from shifting. 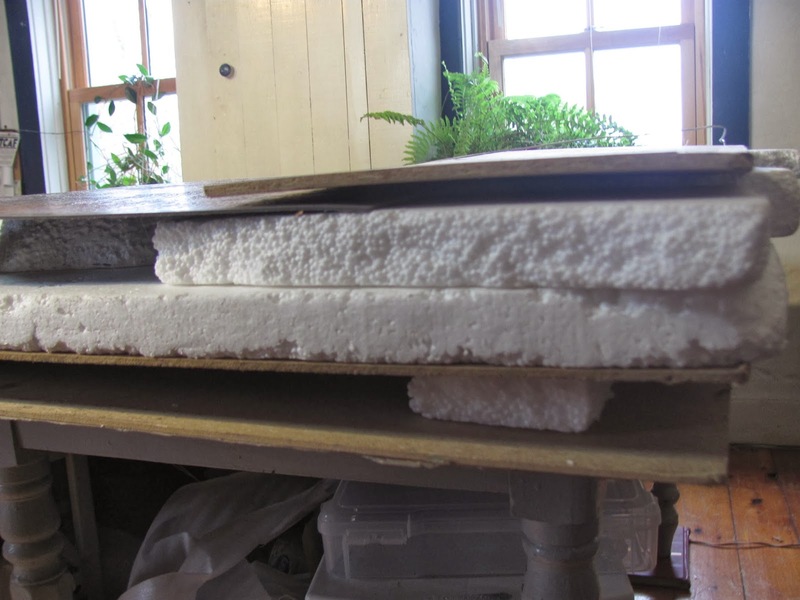 My next step is roughing in the first level of terrain with pieces of styrofoam. The playing board will have four levels, so I obviously start with the lowest first. I keep about four garbage bags of styrofoam bits in the basement, some tapered on the edge but not all. 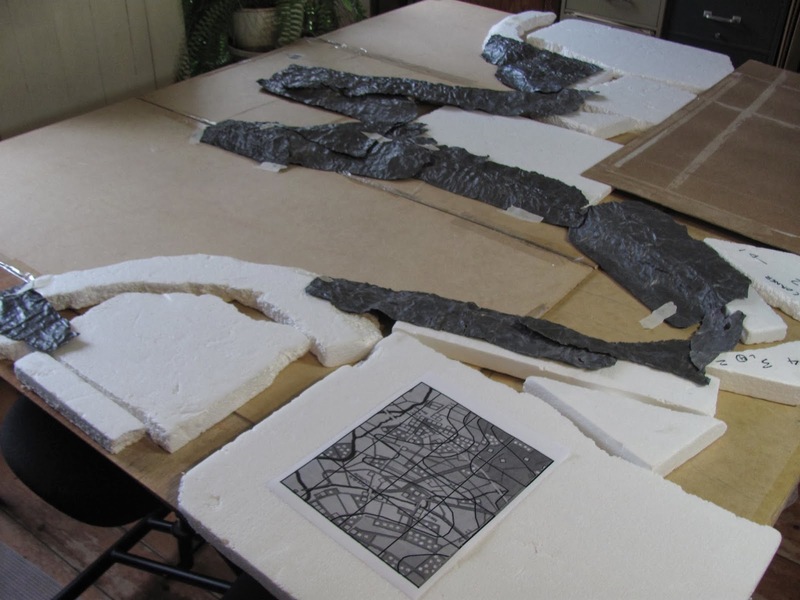 You can see the wonky wire grid I've made, 18" square as I'm sizing up the map by half again to accommodate 20mm figures. 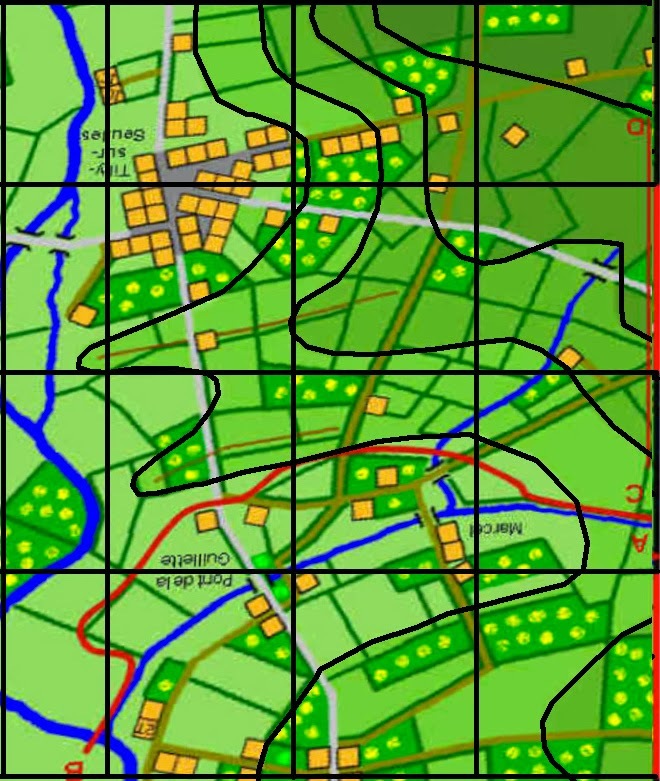 In essence the grid represents a square foot of map. 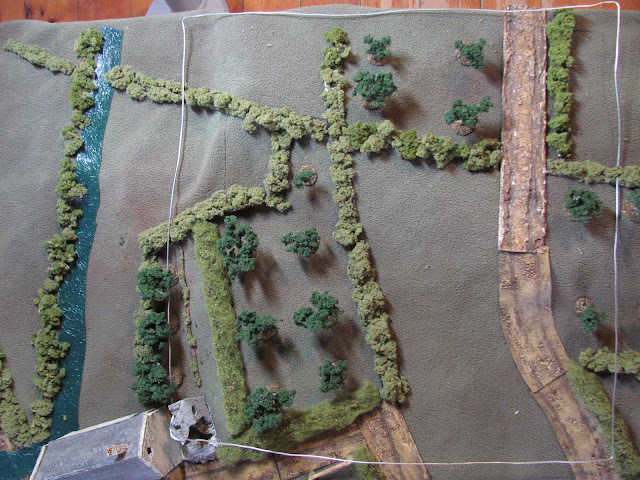 Here is the grid in use with some of the first level terrain roughed in. 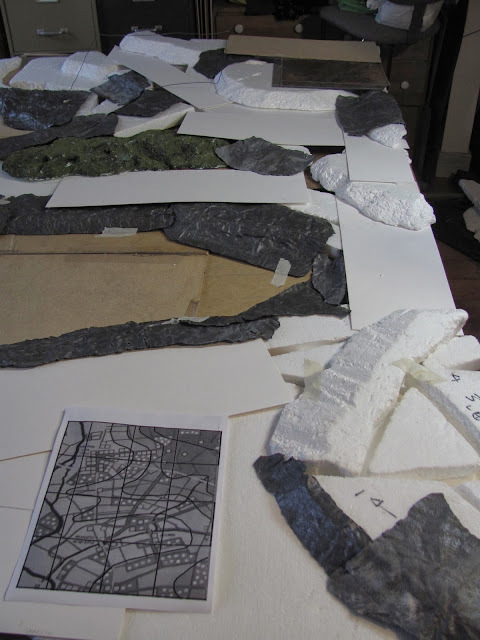 Below is the section of map being recreated (lower left black terrain line). 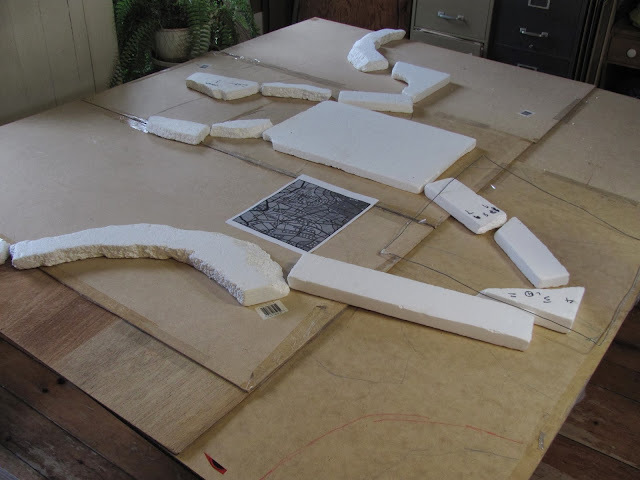 With the first layer roughed in with styrofoam, I taper the edges of the contours that aren't already tapered and link the bits using sheet leading. I scrounged pieces of this from a renovation building site and love it for terra forming. 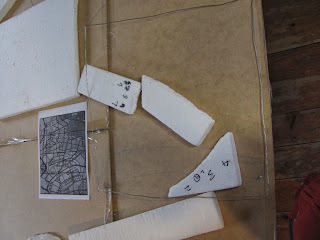 But the edges could be softened and linked with bits of fabric as well, which is what I used to do. The advantage of the sheet leading is its pliability and firmness. I build up successive layers using the same techniques, moving the grid across the board foot by foot. Bits of stiff card are used to cover over gaps in the styrofoam pieces and more sheet leading is used to contour the edges. This picture shows levels one, two and three completed. This picture shows a cross section of the table (and my junk underneath!) with its stacked layers. And here are the completed levels. 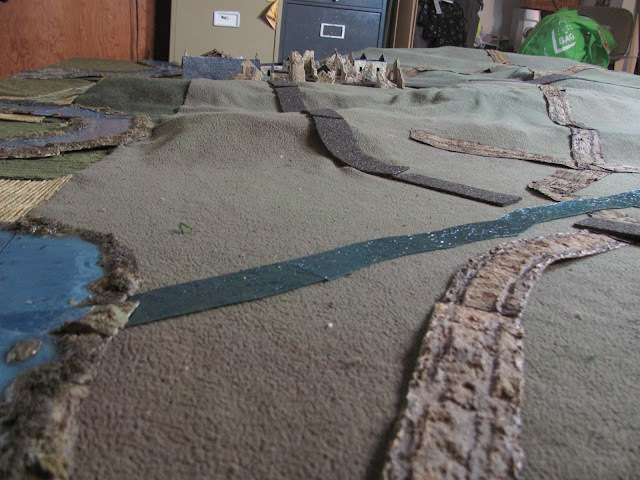 Next I spread my ground cloth over the terrain, snugging the cloth to the terrain as closely as possible. In Battlefront the various levels are important to be able to identify for spotting purposes, so the edges of the levels need to be easily identified. 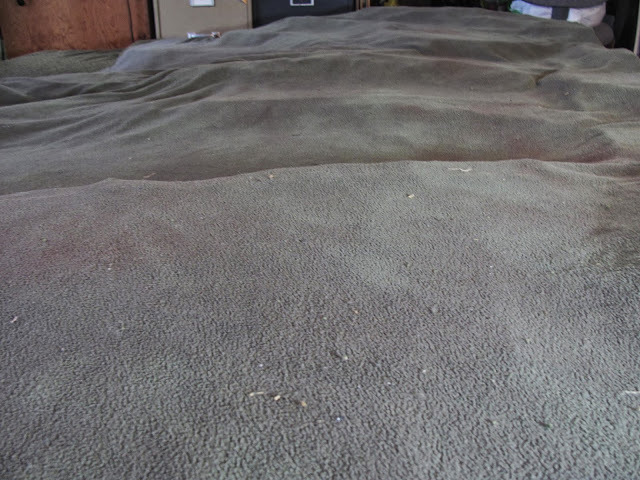 This ground cloth (I have a few different ones for different terrain) is a dark green slightly textured fabric I picked up cheap at the discount bin in a fabric store, mottled with a bit of spray paint. 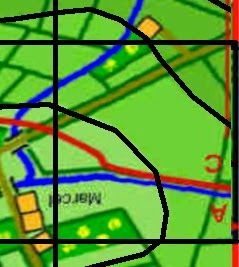 My next step is to rough in the roads, streams and river, again using the grid to get everything in its proper place. I'm not sweating the details at this point, as I can always tidy up the connections afterwards. In the foreground you can see I have employed two different types of dirt road sections, stiff ones that I created early on in my gaming career (yes, it's a career!) with card and later ones that I have done on fabric so that they can conform to terrain. I ran out of flexible ones so had to use some of the stiff ones for flat areas. You may also notice that my ground cloth didn't quite span the board so I used bits of "field" fabric from my grab bags to cover the rest (left side of photo). The terrain is so varied and broken up that this won't really be obvious by the end. 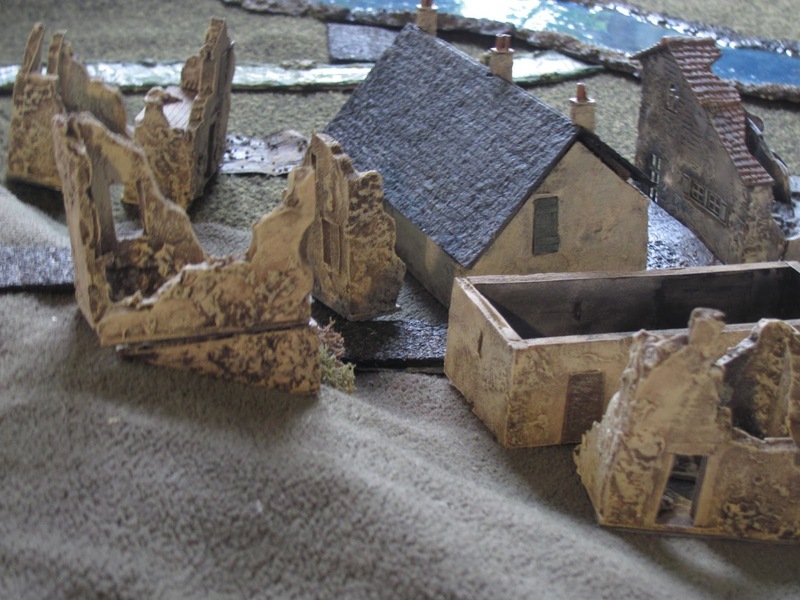 And finally, I have roughed in the streets and buildings of Tilly at this point as that bit of crucial terrain has to be right for the rest of the table to work. 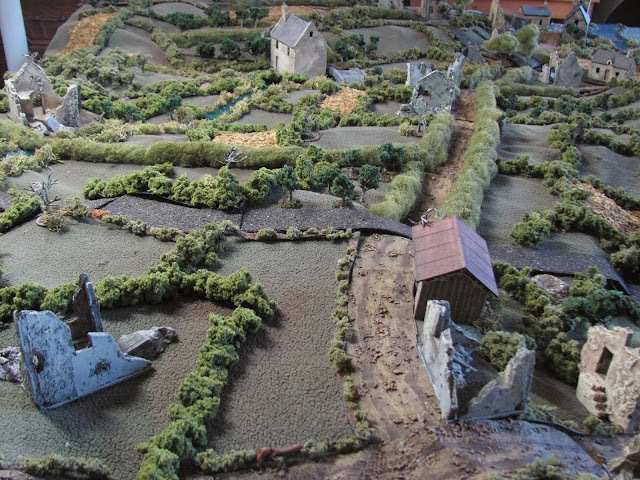 Here is a ground eye view, showing the terrain levels and the undulating roads and streams. The paved road is strips of asphalt tile which I'm not totally satisfied with as they have a bit too much profile, even though they can be bent to conform to the terrain. The stream is my newest creation, a heavy vinyl, spray-painted on the back side, coated with tub and tile clear silicone on the top, and textured by beating it with a plastic spoon (thank you YouTube!) 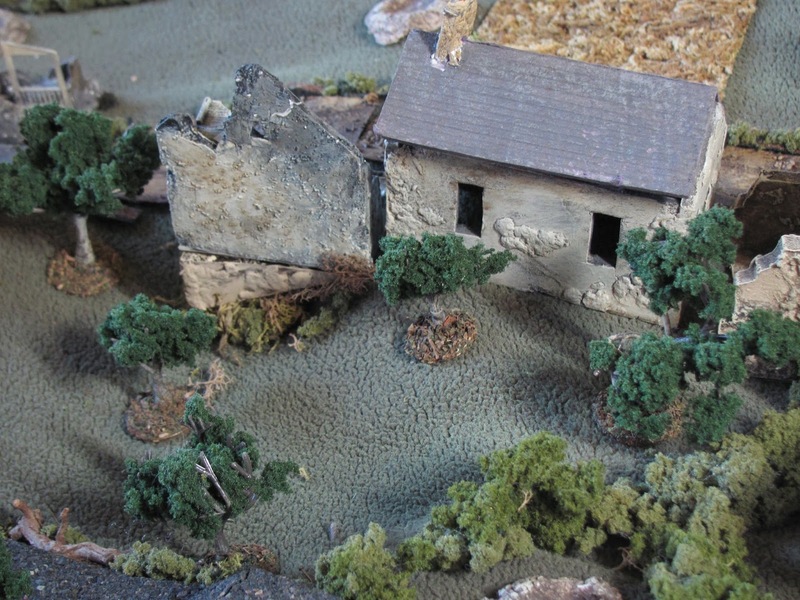 This has finally completed my quest for a stream that can conform to terrain, something I can create metres of for pennies and very little expenditure of time. Now I add the rest of the buildings, mostly using my modular ruin pieces as this was well fought-over terrain! To my mind this is the ugly part the board has to go through before one can get to the extensive finishing touches. As an artist I know that every painting goes through the same stage (or modeller, when you have done some of the underpainting - you know what I'm talkin' about!) and you just have to move through it. The building on the left shows one of my more recent solutions for building on sloping terrin. I created about a half dozen or more wedge shaped bases that I can set my houses on, as I hate seeing buildings at a 45 degree angle on a hillside. 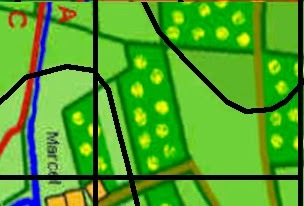 Using my grid again I now place all the hedgerows and orchards. Mark's map has more hedgerows then any I've encountered and I exhausted all of my hedgerow bits. I have attached Woodland Scenics clumping foliage to strips of velcro that are adhesive one side (adhesive hook and loops strips that I buy at the Dollar Store) so that my hedgerows can conform to undulating terrain without rolling downhill. Below you can see the bit of map this represents. Here is the completed table. After placing all of the hedgerows and orchards, I have placed bits of field to break up the terrain (lichen sheets), bordered the stream with more lichen and softened some of the road edges with narrow velcro strips with small bits of Woodland scenic foliage to create a verge. A few details. Here is an orchard with another building resting on the wedge-shaped base that allows me to place buildings on slopes. The chateau just south of Tilley. 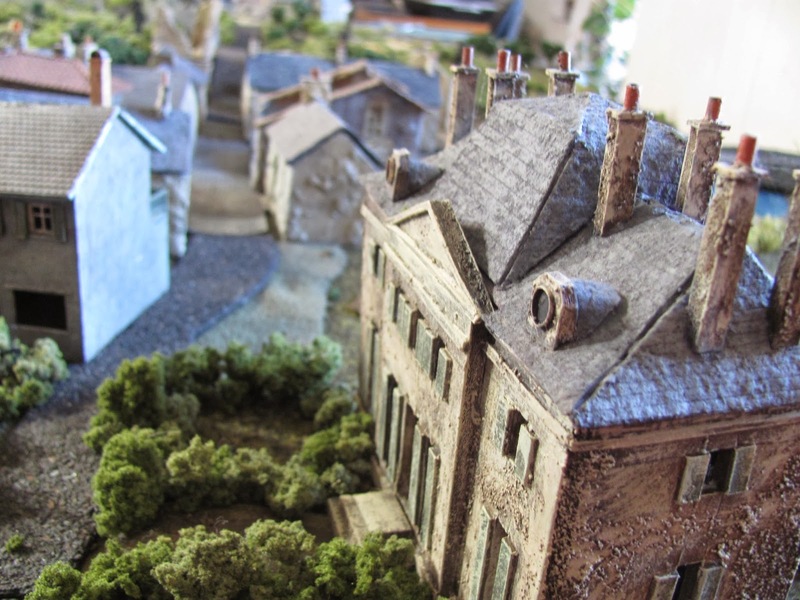 I built this building specifically for this scenario, roughly basing it on the actual structure which still stands today, but at a size and proportions that can cover the correct footprint. 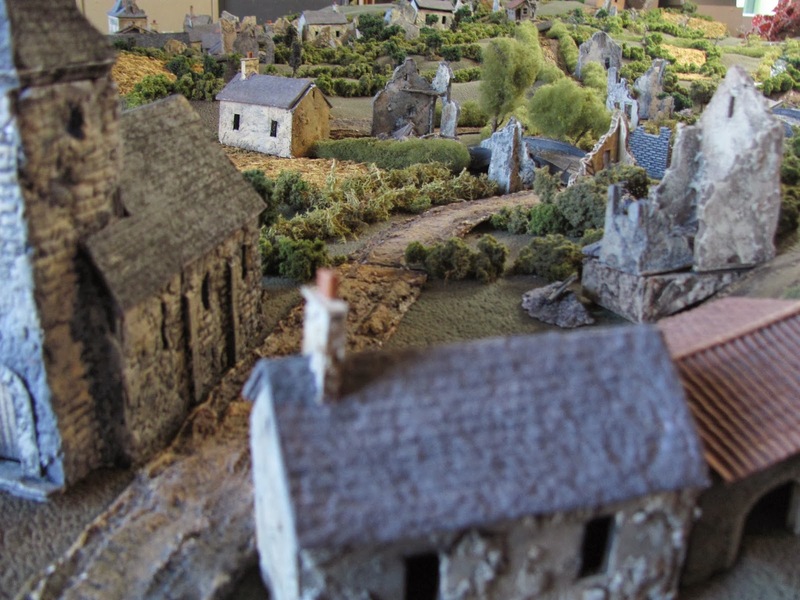 Marcel, the hamlet located in the dip down to the stream, with its two bridges. 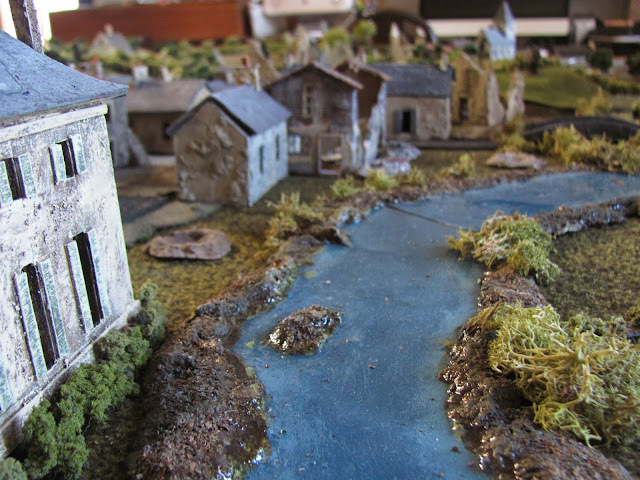 The river (I'm guessing the Seulles) which runs up one side of the board. These I created on stiff pieces of card and originally simply painted them. But this summer I got inspired and coated them all with a super thick shellac (the kind used to coat tacky wooden-based souvenir plaques with stupid sayings) which makes the river satisfyingly wet! Tilly houses. 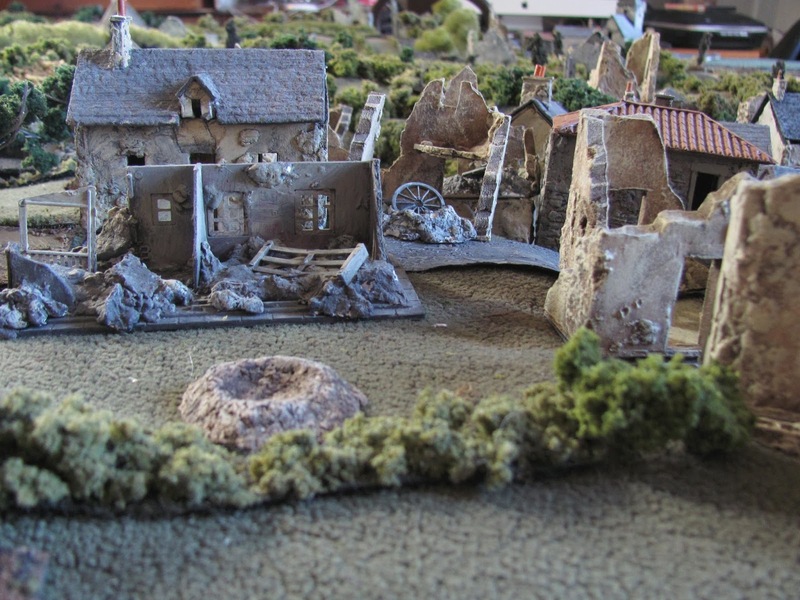 I find ruins serve wargaming well as you aren't fiddling with removing roofs. 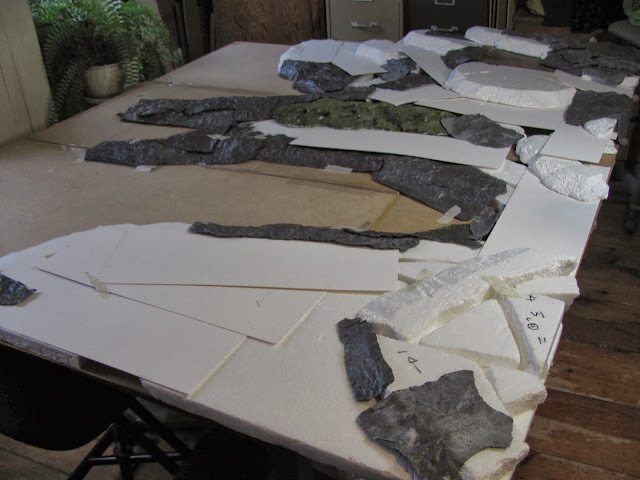 You can see some of the rubble bits I have created to break up the streetscapes as well as shell craters made with a papier maché product, Sculptamold. I use this on my buildings for texturing as well. Indispensable! The view from the high ground, showing the undulating terrain down to the Pont-Esprit stream. In the foreground you can see some of the velcro strips with foliage that I use, thick ones for hedgerows and skinny ones for verges. View from the area near Buceels, the British-held side of the board, with Tilly in the background and the high ground in the top center. Superb terrain. Having good a dedicated space seems to be a must for this sort of game. 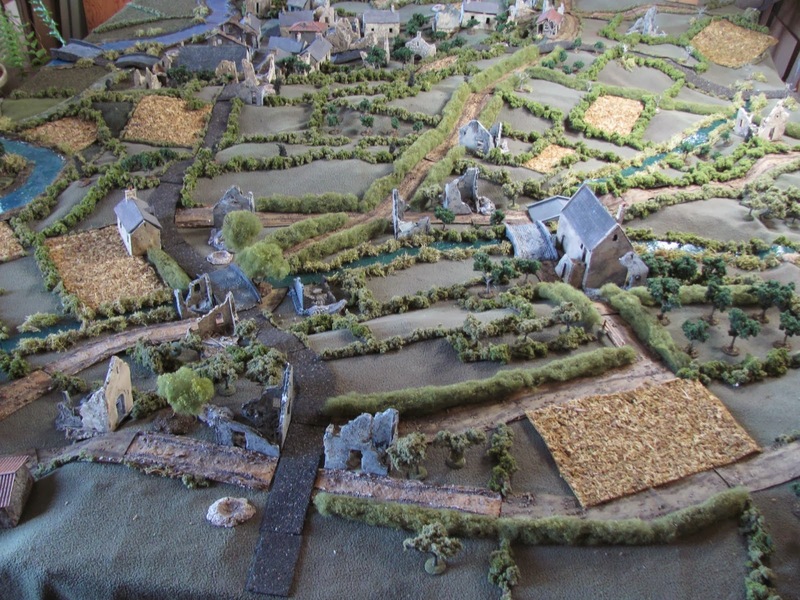 Do you know how many hours you spent setting up the terrain? Thanks for that, Andrew. It has been a while since I built this table, but I expect I puttered away at it for a week, a couple of hours a day, as I do have a dedicated space and it was a difficult table to build. 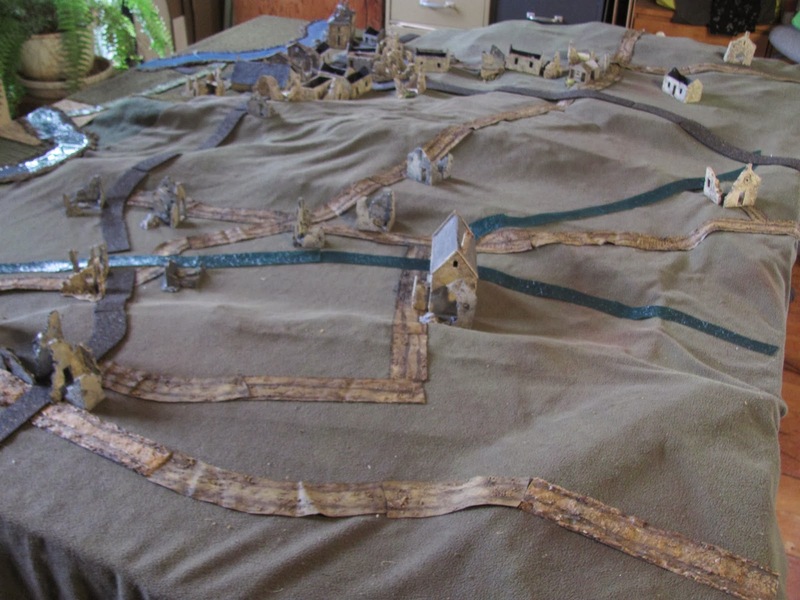 But having said that, a similar table for my Rots scenario I put together in a day as it was in a rented space and that was all the time I had. That was about 6 to 7 hours set up time.